Shown with topaz and peridot crystals. Two 3D baby angels are playing trumpets inside of a heart. This is a precious way to symbolize twin loss, multiple miscarriage or infant loss. You can add crystal dangles to represent each child, select option below. 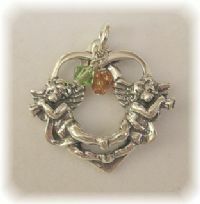 These cherubs would look beautiful on a charm bracelet or necklace. Our available chains are below.